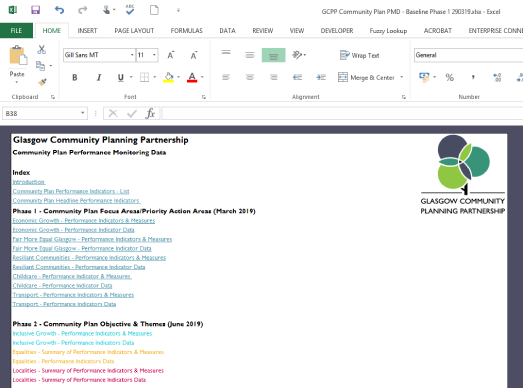 Welcome to the Performance Management Framework (PMF) for Glasgow Community Planning Partnership. This portal establishes a robust performance and reporting framework for Community Planning in the city and is the central resource for all things performance. The PMF consists of four key elements which are interlinked and re-enforce one another; Communications, Data, Evaluation, Health Check. Our Performance Dashboard provides visualised and structured performance data on the progress of the Partnership at any given time. 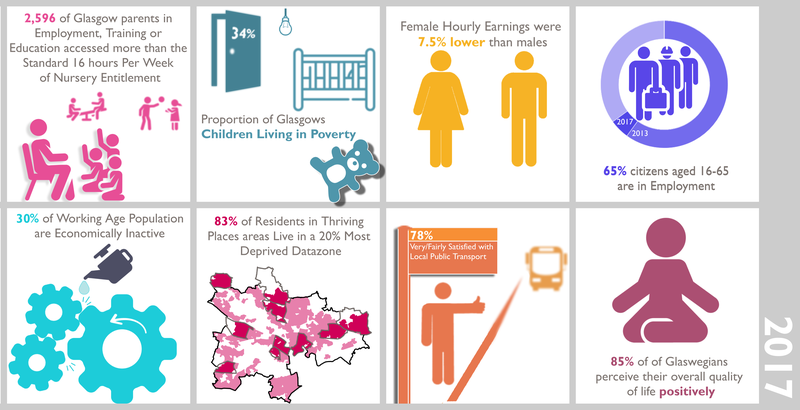 The dashboard focuses on the headline performance measures within the Glasgow Community Plan and will be updated regularly. A full range of Performance Monitoring Data which drives the dashboard, informs our infographics and underpins reports is available open for all in the attached excel file. The performance data provides a detailed list of measures that we will use to track the impact of the Partnership across all of our priorities in the years ahead. We have developed a range of infographics which provide an engaging format using graphical representations, keywords, and concise data to create a summary of Partnership performance. We will update these with new performance data when available. We aim to enhance the frequency and depth of reporting around the work of the Partnership. A selection of reports will appear here. 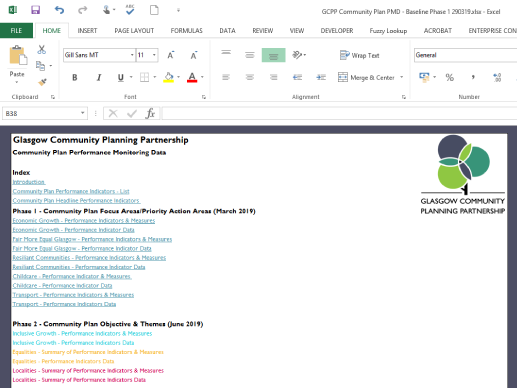 Status updates are provided to partners on a regular basis to track progress on the Community Action Plan for the Glasgow Community Plan. The Partnership will instigate a programme of evaluation work to assess the collective success or otherwise of the investment by partners around our shared priorities. 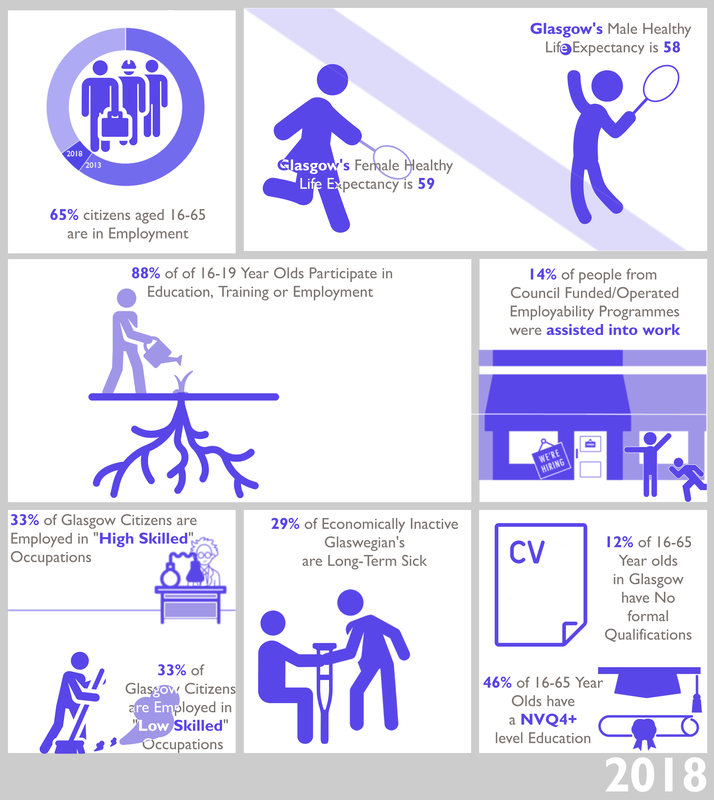 We will undertake an initial evaluation programme in due course for the Glasgow Community Plan. 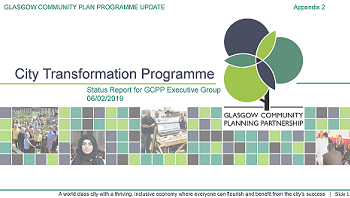 This will take a deep routed look at the extent to which Glasgow Community Plan priority and focus areas are embedded within partner's strategies and practices over a 10 year period, and also how Partners are shifting resources accordingly. The evaluation will also examine for evidence of a shift to preventative and early intervention approaches. Further information on the evaluation programme will be published here when available. A fourth element to assess how we are performing is by examining over time the attitudes, behaviours and opinions of those involved in the Community Planning process to determine how we are working with one another across the Partnership. We will do this by means of an annual "Partnership Health Check Survey". 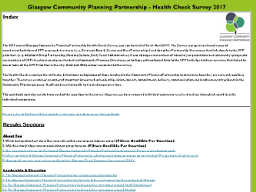 The Partnership Health Check Survey takes place annually, with responses received from partners either directly or indirectly involved in the Community Planning process in the city. The survey examines issues such as leadership, vision, communications and delivery of those involved in the partnership.